Keeping birds away from outdoor crops is a difficult task. GrowingProduce.com speaks with Bird-X to discuss humane and effective ways of deterring birds from orchards. GrowingProduce.com, the aggregate site of American/Western Fruit Grower, Florida Grower, and American Vegetable Grower magazines, has featured Bird-X products along with Sales Manager Josh Pierce’s advice in an article written by Jackie Pucci earlier this month. GrowingProduce.com is an online resource for the latest in fruit, vegetable, and citrus industry news. 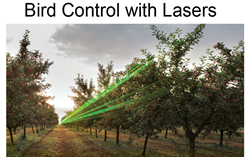 The issue being addressed is bird control in orchards, and how to humanely and effectively keep birds away from such inviting food sources for good. The article goes into detail about how outdoor agricultural bird control solutions differ from indoor or more traditional problems, and why it’s more difficult to deter pest birds once they’ve had a taste of the food at the source. Electronic bird deterrent devices are becoming more and more prevalent in the agricultural industry, due to them having no effects on the crops whatsoever, versus harmful chemical deterrent sprays. Visit GrowingProduce.com to read Senior Writer Jackie Pucci’s full article and interview with Josh Pierce.